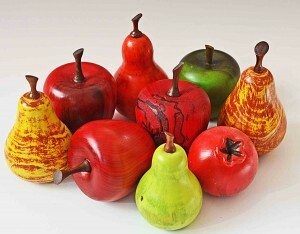 Woodturners have been making fruit for over a hundred years, but we don’t see much of it in the US. When we went to England, the turners made collections of fruit in different kinds of exotic wood scraps. That way, the bowl was like a memory palace for their work. I’ve been experimenting with different color methods–fabric paint, fabric dye, acrylics, and milk paints. Here’s a snapshot of my progress so far. The pomegranate took a bit of carving, too. This entry was posted on Tuesday, March 22nd, 2016 at 12:22 pm	and is filed under Color, Wood. You can follow any responses to this entry through the RSS 2.0 feed. Both comments and pings are currently closed.